Ordering a Van Gogh and having it delivered at home? That’s now a possibility with the kiosks in the Van Gogh Museum. 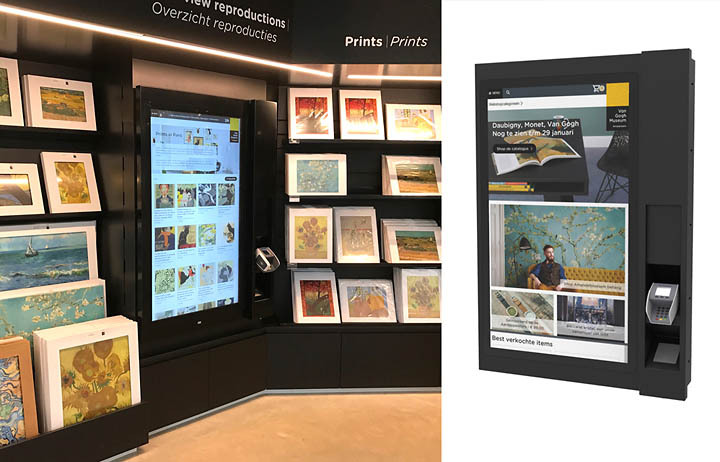 At the shopping kiosks visitors can make a choice from a range of reproductions of Van Gogh’s masterpieces that are offered in the webshop. The reproductions can then be paid for at the PIN module that is connected to the kiosk. The purchase is then sent to the address that is entered. Given that many visitors to the Van Gogh Museum come from other countries, and would otherwise have to take the protective tubes with their purchases with them in the airplane, this is a perfect and well-thought-out service of the museum. The Van Gogh Museum in Amsterdam curates the biggest collection of works by Vincent van Gogh in the world. The permanent collection contains 200 paintings, 500 drawings, over 700 letters and Van Gogh’s collection of Japanese prints. The museum opened in 1973 on Amsterdam’s Museumplein square, and is one of the most popular museums in the world.